If you want to know how fickle the Melbourne dining game can be, write a guide book. Between January and going to press with this year's Good Food Guide, there were probably half a dozen changes within two blocks of Bar Lourinha, which has stood its ground for 12 years. Don't believe me? Count 'em up. In Flinders Lane, contempo-French Oter shuttered, as did Papa Goose. Kappo's kaiseki offering became a hella good hotpot heaven, Master Den's Poppu Uppu. Kisume's fine dining service also switched from the kaiseki format to a 20-course omakase sushi offering with new chefs. The Ettamogah pub brand had a brief crack at upscale dining on Bourke Street, and Ishizuka, another premium Japanese restaurant, changed chefs after just four months (despite the original chef's name being over the door). What is it about Matt McConnell and Jo Gamvros' tiny mighty Iberian bar that has staying power? Certainly the room, always likeable for its low lighting and curios – the glowing Jesus statuettes, flying ducks, bay leaf switches and copper lobster moulds – has only continued to develop. No inch of wall space escapes ephemera-free, but the effect is cosy rather than hoarder-esque. McConnell's menu has also always had perfect flex to weather the tide of Melbourne trends. It's snack-based and broadly draws on delicious things you'd find in markets and bars from Spain to Portugal and sometimes Italy. If anything, Melbourne's dining style has only grown to emulate theirs. 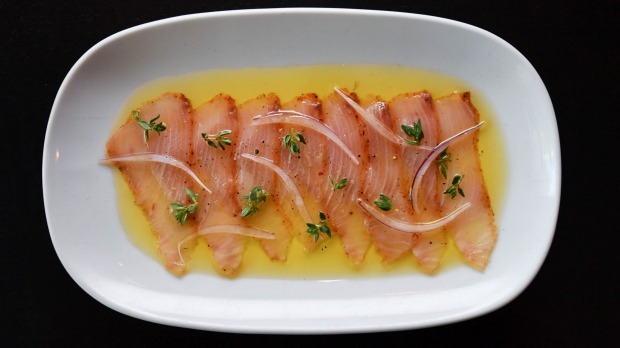 Before kingfish carpaccio became a virtual scourge of menus everywhere, Bar Lourinha was doing it as "pancetta" in lemon oil. It's still one of the best ways to eat that subtle fish. The salty, sweet and spicy curing process intensifies the flavour, creates a supple, soft texture, while the citrusy Italian lemon oil, fine slips of red onion and thyme boosts it into the stratosphere. It's never left the menu. Almost everything else rotates or mutates regularly enough to keep you guessing. Croquetas are always sticky and silky at their molten potato core, maybe richer in winter with salty jamon, or ghostly smoky with eel, while right now in spring they're bright (as a fried snack can be) with nettles. Over the years, their migas, a peasant dish of day-old bread, torn and fried and rumbling with sliced garlic, parsley and lemon, has starred confit rabbit but at present it's extra rich with whole pan-fried chicken livers. Just add a bone-dry sherry for the win. Spice, seafood and salted things are always the reliable threads tying the menu together. That might be olives pulled from a barrel on the bar; morcilla (like blood pudding, with extra cinnamon kick) captured in lacy pastry cigars; a special of fresh sardines, low on funk but high on impact from a quick char and dressing of mojo verde – cumin-tinged coriander blitzed with garlic, lemon and oil. Thankfully it's a little more vego-considerate than actual Spain. 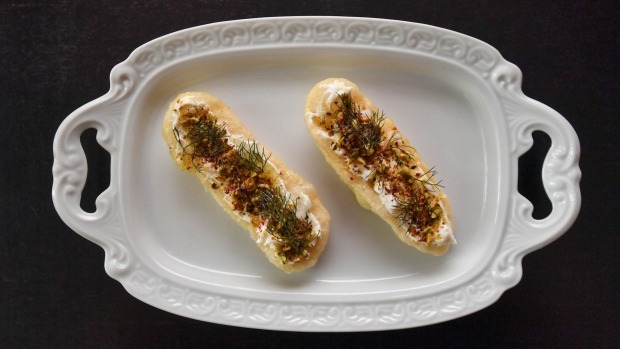 Fried bread, bubbly like Italian gnocco fritto, is spread with fresh labne, pistachios, fennel fronds and the tart-heat of pink peppercorns. 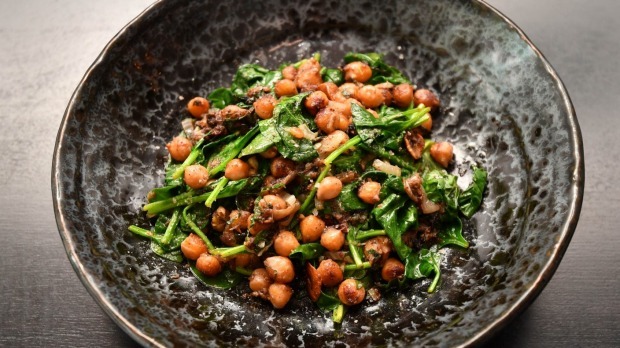 Or there's the classic chickpeas and spinach, which, after a hearty bath in olive oil, are tumbled with a fragrant mix of onions, coriander seed, fennel seed, cinnamon and more to make a solid main. Interestingly, what you're drinking with all this, aside from the finos and some cavas, are mostly wines from France, Italy and Australia, with a few unfiltered and skinsy oddballs. A nice touch: half bottles can be negotiated for half price. 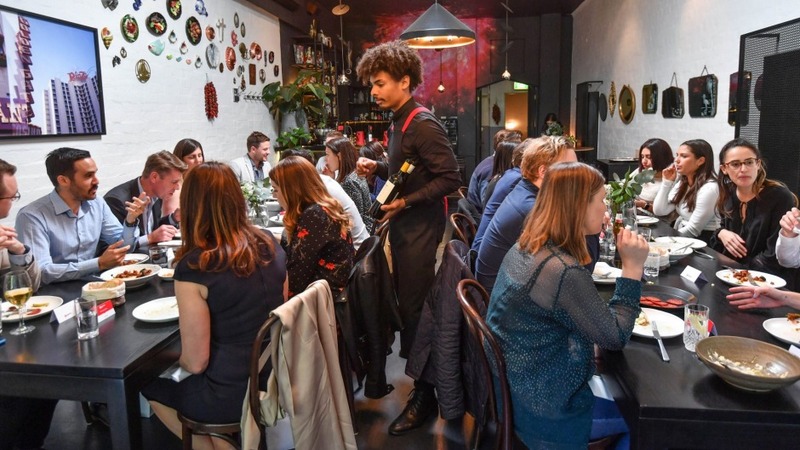 It's those niceties and a fair bit of looseness – including floral, mismatched plates, a random soundtrack that keeps you guessing, a bookings policy but also room for walk-ins as much as anything – that keeps Melbourne coming back. Bar Lourinha isn't perfect. Strangely, that might be part of its charm. For a couple of years Gamvros and McConnell operated Casa Ciuccio on Gertrude Street, but the sleeker space with an outdoor fire pit never gained the same traction. Here at Bar Lourinha, there are nights when service could use a tune-up. Occasional specials like a paella-style prawn dish made with broken pasta needs extra seasoning and doesn't quite ring the bell. But the misses form a low stack next to 12 years of hits. Those would be hot churros and thick chocolate for dipping. You'd also count the crema – a thick panna cotta-like thing stained with a dark blood orange caramel. How many relationships are owed to a first knee squeeze at the bar? Doubtless many. Hopefully there are many more to come. Pro Tip: All the recipes and travel tales have just been dropped in a book, Eat at the Bar (Hardie Grant Books, RRP $50). Go-to Dish: Kingfish pancetta $22; chicken liver migas $29; spiced chickpeas and spinach $16.